Get ready. Because no amount of free Biscoffs can fix this. Over the past few years Delta has continued to make changes to the way travelers can earn elite status. I hadn’t paid much attention to it because I knew I’d always get there through my business travel. But, then all my wanderlusty dreams came pouring out of me and one thing led to another and I no longer traveled for work. Because I no longer worked. Unless you consider standing around in the same skirt every day with braids and a piece of dirty masking tape on your shin work. It might be. Somebody’s got to do it. There are a 3 reasons why even the lowest elite status on Delta, Silver Elite, is good for a person like me. 1. I don’t care about first or business class upgrades. Just give me a seat that seems like a fair deal and I’m happy. I’m not too worried about being upgraded every single time I fly. It’s nice to get a free upgrade here and there and that’s what you get with Silver Elite. 2. I carry-on most of the time and like to be sure I’ll have room to throw ’em up top. With Silver Elite you board with Zone 1 which means always having room in the overhead. When I fly Delta I often prioritize the miles I’ll earn versus the most direct route, which is a nice benefit of having a job where I stand around with masking tape on my shin. I’ve got time to take the long way, thankfully. Once, to get from New York to Denver, I flew NYC to Atlanta to Detroit to my final destination, Denver. I trust Delta with free cookies, but not with my bags so being sure I can keep them with me is nice. 3. I travel on a budget and won’t pay to check bags. Masking tape doesn’t grow on trees and I like to make sure I’m getting the best deal. So, if I absolutely must check a bag it needs to be free. With Silver Elite you get one free checked bag. 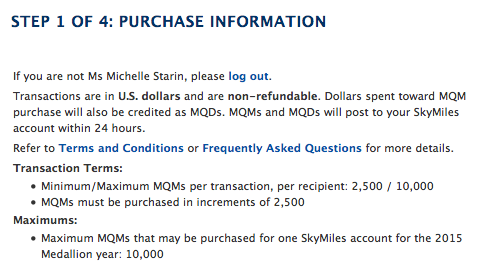 Prior to 2014, simply flying and earning Medallion Qualifying Miles (MQMs) was enough to earn status. 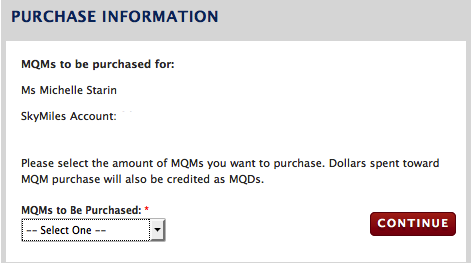 In 2014, Delta made things a bit more difficult by adding Medallion Qualifying Dollars (MQDs) to the requirements. Instead of just flying 25,000 miles per year, one needed to earn those miles AND spend $2,500 on qualifying travel for the year. That’s about 6 trips a year if you’re averaging RT tickets of $400 each. Not impossible, but it definitely makes the thrill of finding the cheapest flight a bit less thrilling. There’s one other way to earn elite status. I won’t get into detail about it because it’s never applied to me, but flying 30+ segments in the year can be added to meeting either the MQM or MQD requirement to earn your status. I spent 2014 flying Delta as much as made sense, which was almost always. The only exceptions were when the mileage to be earned wasn’t worth the higher price (it’s math, ya’ll) and when I knew I’d be able to carry-on. If you’re flying Frontier or Spirit don’t forget to add on the price of both checking a bag and carrying-on if the bag is bigger than they’d like it to be. As a budget traveler, it sometimes pained me to take the higher priced ticket but a year’s worth of free luggage, Zone 1 and the (sometimes) upgrade that led to free wine helped ease the pain. There were times that I actually did the calculation of glasses of cheap wine. After a RT flight to London’s Heathrow in December 2014 I’d made my Silver MQM requirement. I thought I might hit the dollars as well, but I’d already done so much math in 2014 that I couldn’t do any more. I should have done just one more math problem because I was $27 short of my MQD requirement to earn Silver Elite. “NO PROBLEM!” I thought. In all caps. I’ll call them and we’ll work it all out and I’ll be Zone 1-ing all over the place. False. I somehow confused myself into thinking that the 2014 earning cut-off was in February 2015 giving me an extra month to call Delta and charm my way into making sure I’d earned Silver Elite status. Friends, I am here to tell you that the cut off for the year is (not surprisingly) at the end of the actual year. So, when I woke up on January 1, 2015 I was $27 short. This week I finally got around to calling them to see what can be done. The answer, ladies and gentleman, was a roller coaster of emotion. The first representative told me there was nothing to be done. LOW POINT. But the supervisor I requested to speak with told me that all was not lost. HIGH POINT. MQMs can still be purchased through the end of January 2015 to count towards 2014 status. AND, the dollars spent on these MQMs count towards your MQDs. HIGHER POINT. Rules. 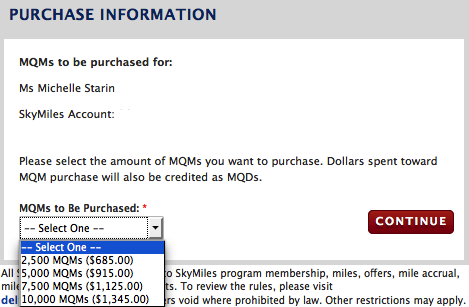 Delta calls it “Purchase Information.” They’re rules. Meant to keep ya’ll in check. Luckily the minimum amount to buy is 2,500. Should be affordable. Hang on little miles, I’m comin’ to gitchu. Almost there. Just choose the number of miles you want to purchase from the drop down menu. $685 for 2,500 miles equates to $.27 per mile. If you were to buy a RT ticket from JFK to LAX (about 2,475 in airline miles flown) on Delta today, you’d pay about $.12 per mile. 1. Power to the people, as my father says. I’m not done talking to Delta. I’ll call them again to try to argue my case. I’ve already got AA points that mostly just sit there. US Airways almost always comes up as the cheapest option when I’m searching for fares. I don’t love the Charlotte connections, but I can get around that if I try. There’s a great MasterCard offer happening right now. I’m not big on signing up for credit cards for the bonuses, but this one was worth it to me. Once approved for a US Airways Premier World MasterCard, you’ll get 50,000 miles. You’ll need to make one purchase (of any value – different than many cards that require you spend $3,000 in the first 3 months) and pay the $89 annual fee and you’re on your way. I won’t actually use this card after making the qualifying purchase, so I’m not too concerned about the high APR. What compelled me to actually apply for this was the mileage cost of US Airways reward travel. Round trip from NYC to Europe is about 30,000 miles for economy, plus applicable taxes. Cardholders also receive free checked bags, a $99 companion ticket and probably balloons and mini-ponies to ride before you board. I recognize that Silver Elite is basically nothing when you’ve got Gold, Platinum and Diamond customers. But, for someone paying for their own flights versus obvious business travel, I flew a ton this year. One look at my 2014 history and Delta would see that there wasn’t a lot of room for me to have flown any other carrier. A $27 bone throw my way would have been lovely of them. Even after flying Delta almost exclusively for the past 3 years, I’ve had absolutely zero complaints. I’ll be sad to say goodbye to their Biscoff cookies. But I’m more self-righteous than I am hungry for cookies. Welcome to the world of small print. I demand an update to this post! Did you convince them to award you your much-deserved Silver Elite? Power to the People!